Hi fellow planner lovers! While I love using washi tape in my planner and doing washi-tape-only Plan with Me videos, I also love sticker kits. And there are some cute fall ones out now! 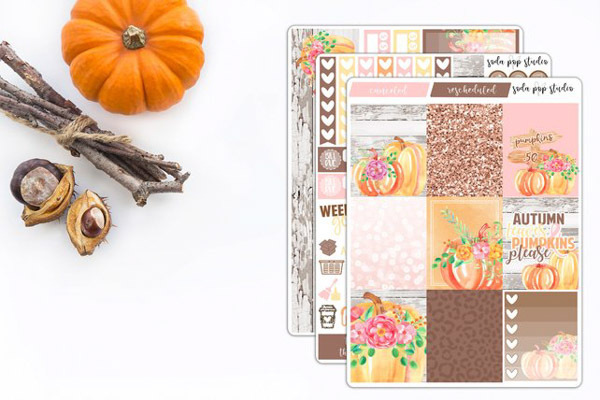 Here are 5 Gorgeous Fall Sticker Kits You Need for Your Planner 2018. I even used one of these in a recent Plan with Me video (linked below). This is a bit of a window shopping post because I simply couldn’t buy all of these beautiful kits. There’s only so much space in my planner, and I’m trying to manage my spending. So despite my strong love of custom planner stickers, I decided to buy just one fall themed sticker kit this year. But, I have purchased stickers from all of these shops, and love their stickers! Please note: This post contains affiliate links. If you make a purchase with one of these links, I may make a small commission at no extra charge to you. Please reach out if you have any questions. 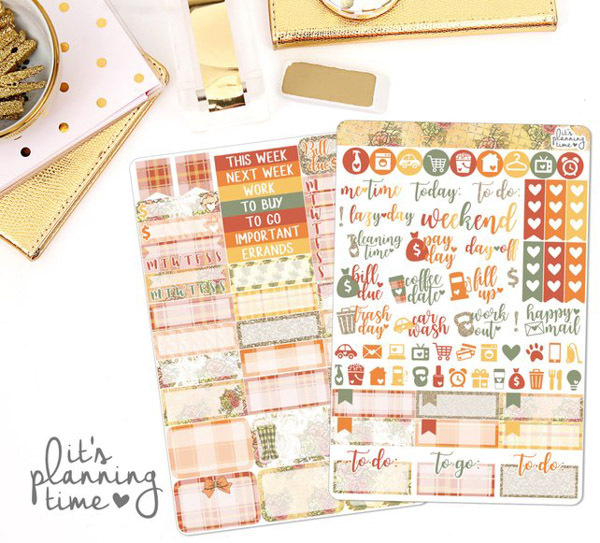 Most of these are designed for the Erin Condren LifePlanner, but many shops note that these stickers can be used in almost any planner. 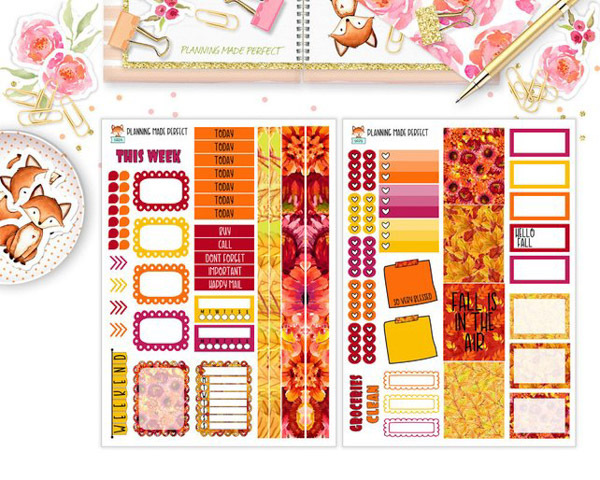 This 2-page weekly sticker set “Fall Is in the Air” by Planning Made Perfect has a nice mix of full box stickers for color and decoration along with plenty of event, pointer, washi tape, and habit stickers to pull this theme nicely throughout your planner. Love how they mixed pink into the traditional reds, oranges, and yellows of fall. So this is the kit that I actually purchased. There’s a Fall Sticker Kit Plan with Me video available on this blog post for this adorable “Sweater Weather” sticker kit by It’s Planning Time. This is a 2 page kit with orange, red, yellow, and green colors and plaid and floral patterns. I love that there are so many box stickers in quarter and half sizes. Though I don’t typically use icons very much, since I can use them over the course of two months, I have a feeling they’ll get put to use. These stickers have been transferring well to my other fall themed weeks, and I’m even using some in my October monthly spread with plans to use some in November too. For the neutral fans out there, how pretty is this YASSS FALL Mini kit by Caress Press? The designs on these stickers are so detailed and fun. This set comes with 5 sheets of stickers and is available in matte or glossy. If you’re new to glossy, note you may need special pens to write on these. You can also get this as a Full Sticker kit, and the full kit will come with 8 sticker sheets. Okay, so I picked not one but three sticker kits by Soda Pop Studios. But just look at them! I was torn between sharing this graphic kit versus the below photography kit. But I couldn’t decide. Haha. 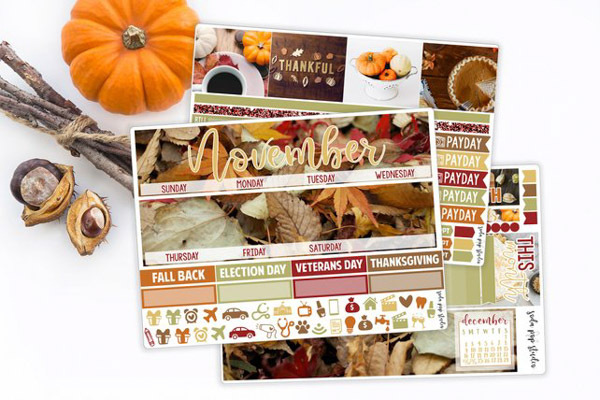 The thing I really love about this graphic “Thankful for Fall Mini kit” is the colors. There’s something about the beautiful mix of browns, oranges, and pinks that I can’t get over. And I rarely use brown as a base color, usually opting for black instead. Plus the little floral graphics are so cute. This mini kit comes with 3 sticker sheets. The full kit comes with 6. 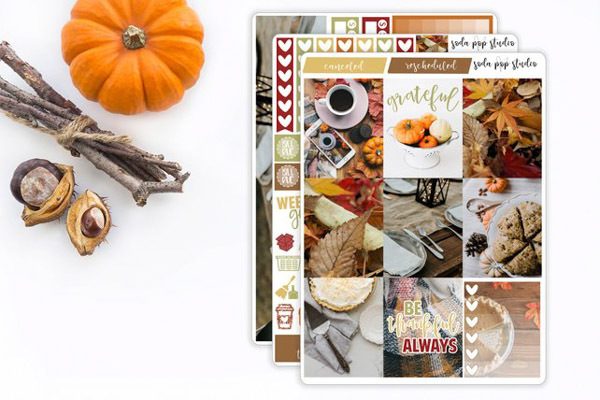 This “Thankful Mini Kit” in a photo style is the second Soda Pop Studios kit. Almost all planner sticker kits I’ve seen before are more graphics-based. So how cool to see photos as stickers! Also, as a food blogger, I love the many food photos included. Yum! And I’ve actually never purchased a monthly sticker kit because I feel like they cover up more of the planner than I like. 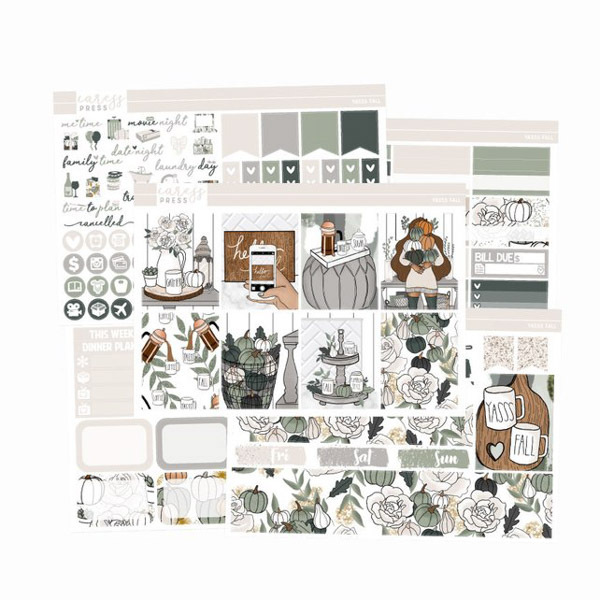 But this photo monthly sticker kit by Soda Pop Studios is so pretty. I’m really tempted to get it. Haha. With this kit, the whole header section of the monthly spread will be entirely covered. You’ll also get colorful day numbers to cover the printed numbers, plus holiday stickers, icons, labels, box stickers, page flags, and more. If you want to totally revamp your monthly spread, this is the kit for you! 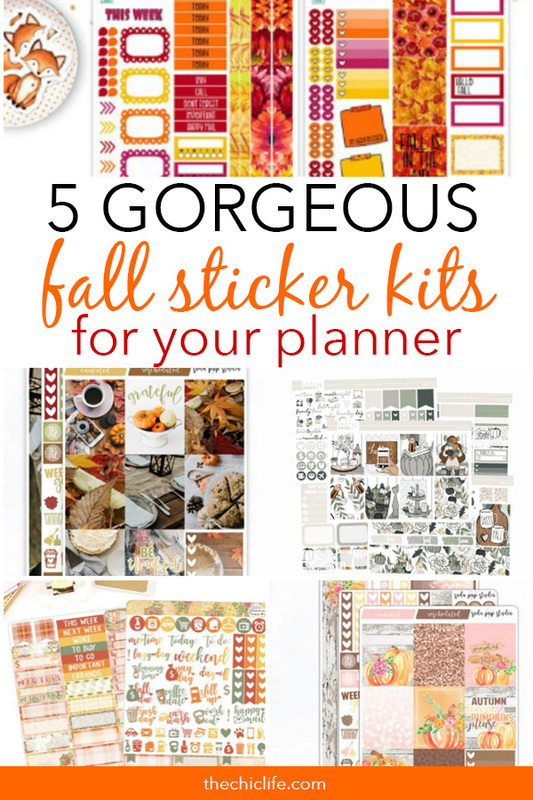 Thank you so much for reading this post about 5 Gorgeous Fall Sticker Kits You Need for Your Planner 2018. Hope you enjoyed it!